Hi my fellow Plastic Addicts. Last week I posted a poll asking what Top 10 you wanted me to do today, Giant-Size 2-pack or Riders set that I wanted made. You guys voted and with a total of 111 votes, 67% of you wanted me to list what I think should be done in the Giant-Size box set. (Rider set might go onto another poll). But what do I mean by Giant-Size 2-packs? Well, you may remember last year Hasbro released an Amazon exclusive Days of Future Past Sentinel and Logan set. Well that set was barely on the site when it first was put up when it sold out almost immediately. This is a high indication that Hasbro will more then likely do more set like this. But who can they do? Well, I have looked into the Marvel vault and picked out 10 2-packs that I want made. I will be including some figure that already got released as it is more then likely that they will get released again. Since most of the Giant-Size figure will be unique sculpt I won’t be including a body type. Smaller figure will. Taking the bottom of the list is Galactus. Galactus has been a big part of the Marvel Universe for year and has been a want for new people for years. So why is he last on the list. Simply. Because he is 95% coming as a re-released of the Marvel Universe version. That figure alone was a perfect version of the Big G so a slightly repaint would work fine. Since it is Galactus, most people would think he would come with Silver Surfer. However, I think they should use this opportunity to do another Herald. While Nova was my first choice, I decided it would be more cost effective to do Firelord, especially since he has been asked for. This could be a easy repaint of the Walgreens’ Human Torch. A new head would be nice and they could easily take Gambit staff and glue 2 fire effect onto either side to do his staff. 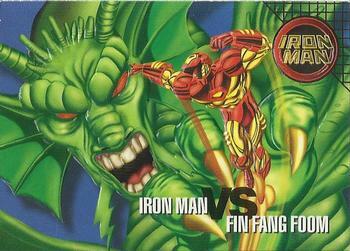 Next up we have a figure that costs a small fortune in the secondary market, Fin Fang Foom. Hasbro was originally going to re-release this figure as a Marvel Universe set but that was cancel. With The Giant-Size set being a success it seem likely that this will get a re-release (thus the reason it’s so low on the ranking). While I wouldn’t moan if Hasbro just straight re-releases it, if they include the Purple Short then it would be perfect. As for, what could be packed with him, I think a new Modular Iron Man would work best. It would also be a nice nod to the 90’s cartoon as well, since the Foom meister was a big part of that series. Next we have something new and something that no matter how big Hasbro make him he will be under-size, Ego the Living Planet. Like I said, the reason it’s so low on the list is that it would be impossible to get this figure in the right scale. I mean most of the character I mention after this can change their size or can work if they are smaller then they are supposed to be. But Ego is a Planet. never going to be the right scale. I wouldn’t mind if Hasbro uses this character as part of their Haslab project. I would even forego a smaller figure but I think Nova would work fine. It could just be a straight re-release of the Groot wave one but it could use the Spidey build and slot that head on it to give us a classic version remake. Taking the first of a number of hero 2 pack, we have the dynamo duo of Giant-man and Wasp. This version of Giant-man was released as a BAF years ago but many people couldn’t or can’t afford it anymore. 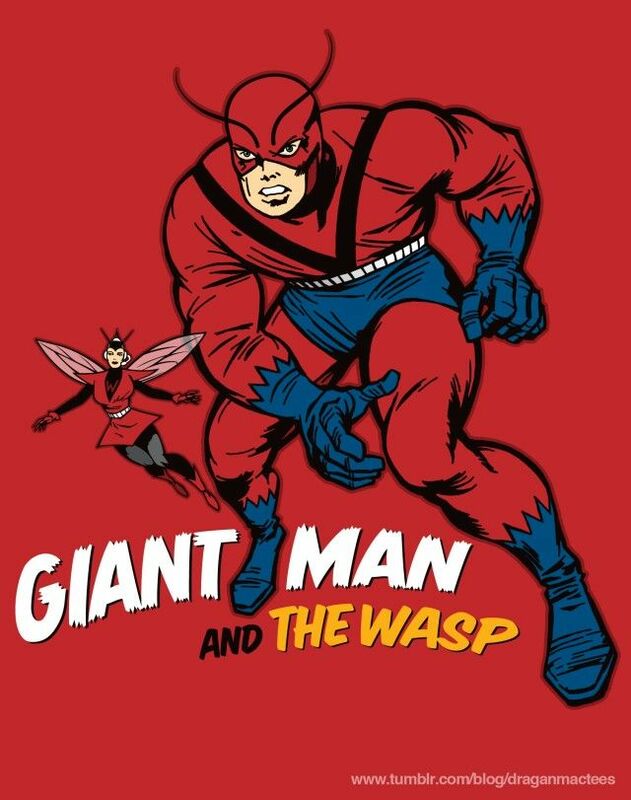 I wouldn’t mind if they do an earlier or later version of this costume as long as it’s the original Hank Pym Giant-man and not Goliath/Yellowjacket/Ant-man. As for the Wasp, many people were disappointed that the Vintage wave figure was not her classic first appearance version. This would be very easy to do with a straight repaint and some re-sculpting of that figure with a new head. They could even include that old head to give us an unmasked head. Next we have the king of the Frost giants and a thorn in Thor size for years, Ymir. This giant ice monster has not only fought Thor but also the Avengers and even the X-men and has been feature in many media and video games over the year, including Marvel Ultimate Alliance. Since we are talking about Frost Giant then the obvious choice for this set would be Loki (Thor will come in this list later). The upcoming classic Loki would work just fine since the Ymir figure would need a heavy sculpted figure. Next up is a character that has actually jumped immensely in ranking since they gave us Songbird and announced Citizen V, Atlas. This guy has actually been asked by fans for years and with Hasbro seemily trying to get the original team together, it seems likely that he will get made eventually. I don’t really mind which version get made but preferably something similar to his original Atlas design would work. As for the smaller figure, I think a re-release of Moonstone would work just find but if Hasbro want to repaint her in for original T-Bolts color with a new head, I wouldn’t say no. Plus it would give fan the figure they missed in the SDCC box set. 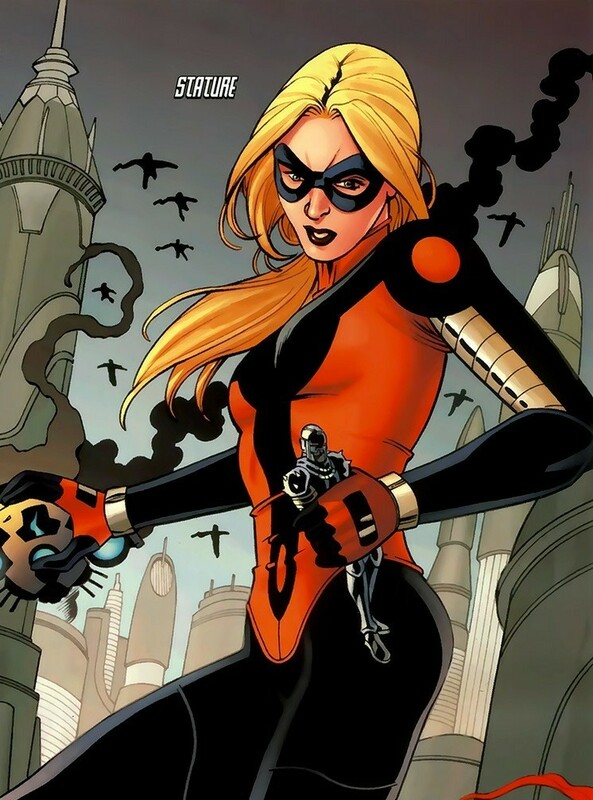 We finally get to a lady giant with the daughter of Scott Lang, Cassie, as her iconic Stature identity. Yes, we did just get her, but she was in her Stinger costume and fans want her in her Young Avengers costume. Not only that but it also bring us closer to not only completing that team but also the Dark Reign Mighty Avengers team. The figure that she should come with should be Kid Vision. It should me noted that this living Iron Lad Armor is considered a separate character to the classic Vision. He could use the Teen body mold with one of the classic Vision’s capes and a new head. 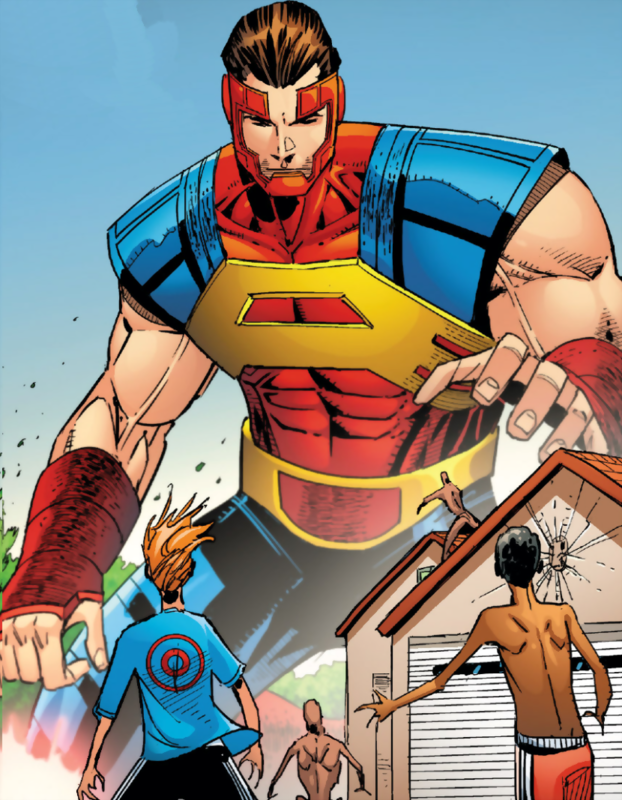 Taking the third place is a guilty wish of mine, Clint Barton’s version of Goliath. For those that don’t know the story, feeling like he was not strong enough to be on the same team as power house like Thor and Iron Man, Clint Barton (Hawkeye) used Pym Particles to become the new Goliath (Pym was Yellowjacket at the time). However, fans hated this idea and soon after the Skrull / Kree war he returned to Hawkeye. He has returned to it on a number of occasions but it was never permanent. He should come with his wife/ex-wife Mockingbird in her classic costume. We did get a modern version of her a Civil war wave but many people wanted her in her classic version as they could build the West Coast Avengers version. This could use the Kate Bishop mold with new lower leg and arms. 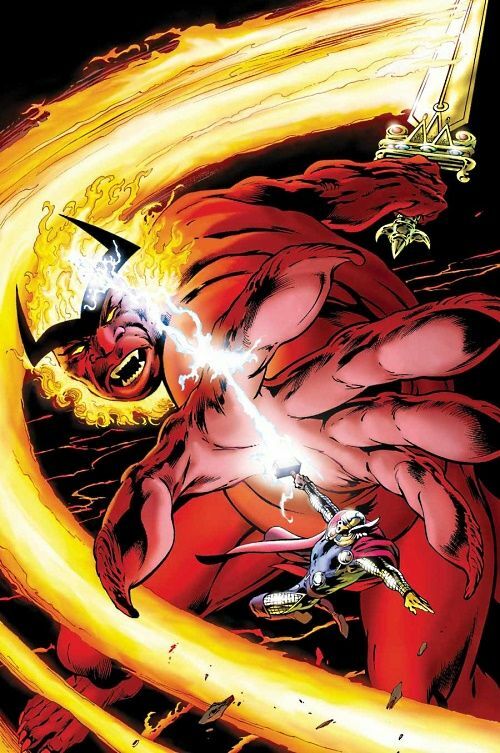 Taking the runner-up spot we have the fire-giant that has recently made the jump into the MCU, Surtur. This flaming demon wants only one thing, to destroy Asgard and cause Ragnarok. He has fought Thor many time and is even considered one of his most frequent enemy. As such it probably comes as no surprise that I think he should come with Thor. While the image shown is of the reborn Thor, I think this would be a perfect opportunity to release the Eric Masterson’s Thor. A classic Thor is rumoured to be coming in the Marvel 80th anniversary set so just make a new head and slap it on that Thor. Taking the top spot is the living embodiment of the Marvel Universe, Eternity. This celestian being is everything that exists in the universe that is part of the holy trinity of the universe, the others being Death and Galactus. He has actually been asked for by nearly every fan out there and has had some amazing customs done of him. Since he was introduced in a Dr. 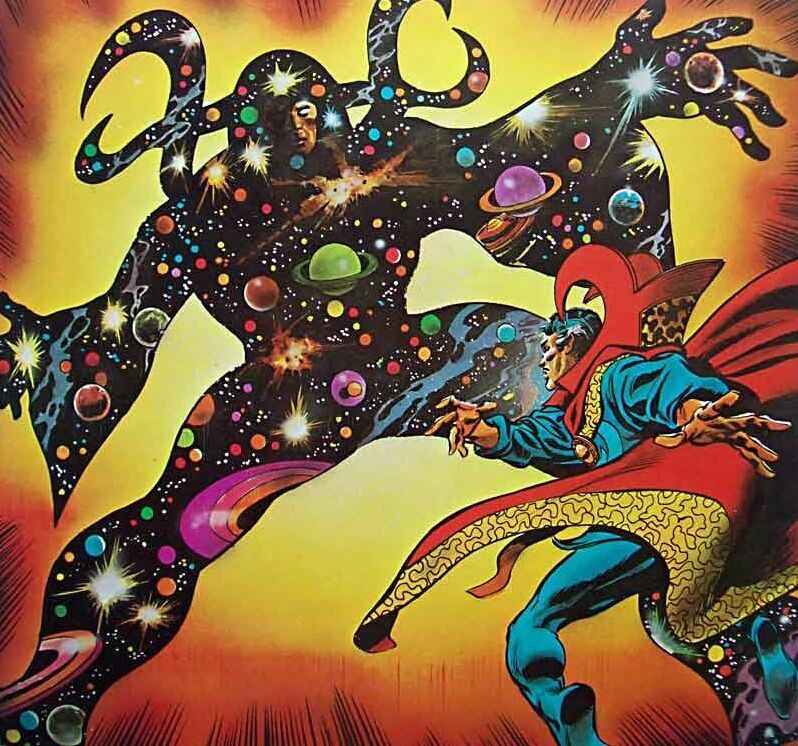 Strange comic, it makes the most sense that he should come with a Classic Strange, maybe with blue pants and a masked swappable head. Well that is MY Top Ten list of Giant size 2-packs I would like to see made. Let me know what you think. Also be sure to let me know what your list would be either below or one of the social sites.